Three bathroom - master en-suite, guest and 2nd bedroom- remodelling in Southridge, Downtown , Dubai together with Bagno Design tiles . Some major changes were made in few bathrooms, beautiful tiles and sanitaries installed. We were limited to make big changes  as per developer regulations but managed to get a wow effect in all three bathrooms! Elegant, chick and luxurious, just as client asked. Used: Italian tiles: flooring: light grey stone 30x60cm and 90x120cm (shower area); Walls: off white tiles 30x60cm; mosaic 3D 30x30; 90x120cm. Huge mirror trough big wall to make the space look bigger. 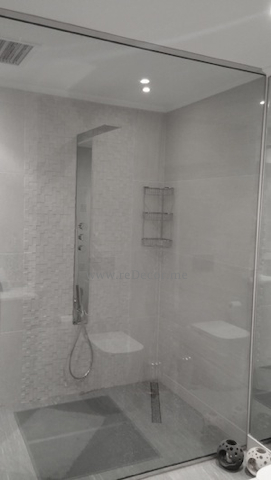 Beautiful shower area with 3d tiles on the shower wall; multifunctional shower mixer. Used: Italian tiles 45x90cm from Bagnodesign, Jotun Crystal coral painted walls; walk-in shower with a slope instead of bathtub. Moved the WC little bit to create some storage space; relocated the washbasin. Used 3 different type chocolate brown tiles: 60×60 on the floor and first 2 tiles up the wall; 30×60 decor tile and completed with 30×60 plain tile. 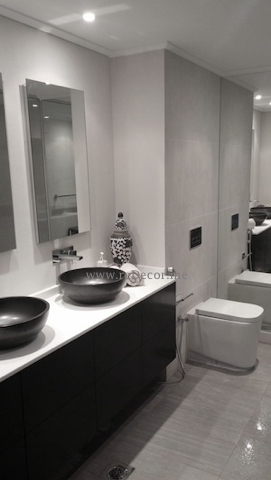 Freestanding marble basin; stainless steel accessories. One wall painted with Jotun ‘Breese’ painting special effect (rough paint beige/brown brush).